There have been a large number of complaints about potholes, and the condition of the roads generally. I have driven all of the roads in Downs Ward and logged all of the potholes on the Hampshire County Council website and am following these up with the County Councillor, about 63 in all. 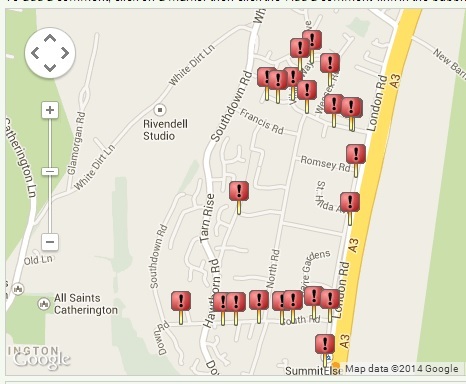 The map below shows the current log of reported potholes in Downs Ward. A lot of these had also been reported already so thank you to anyone who has already taken the initiative here. To report a pothole or see the status of the current logged repairs visit http://roadenquiries.hants.gov.uk/roadproblems/highwaydefect/pothole.aspx?